Use this Chromebook VPN Setup Guide to protect all of the data that is sent to your Chromebook and received by your Chromebook. In this step-by-step tutorial, we first show you the four best Chrome book VPN options – then we show you how to set up the best one. Q: Why would we want to connect your Chromebook to a VPN? A: We use VPN service to securely route (or “proxy” or “tunnel”) your Chrome browser’s traffic through an Encyrpted tunnel to make your data 100% safe, private, anonymous, untrackable, un-traceable, unblocked, secure and unrestricted. 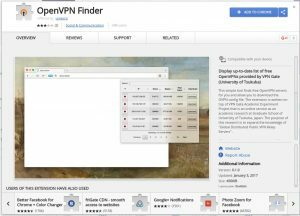 Option A (Free – Least Secure): Use a free VPN browser extension / browser “app” like OpenVPN Finder (go here for the app) . This may work for a quick “band-aid” solution. But public VPN servers are known to be over-used, resulting in slow page load times after you connect to the (“public”) free VPN. To completely free yourself from these slow load times that are common with public free VPN servers, consider shelling out $6/mo for a top-notch Secure VPN. For this, see Options B or C below. Option B (Almost free – Most Secure): Get a complete VPN solution here for around $6/mo from the Secure VPN provider we recommend. Make sure to use our exclusive coupon code FIRETV25 to take 25% off! 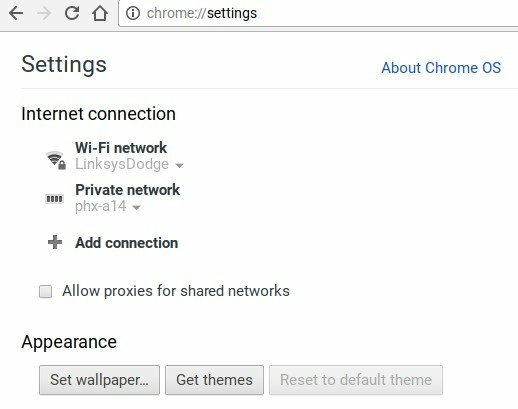 Then follow the steps in the “Chromebook VPN Setup” tutorial section below for highest security & anonymity. 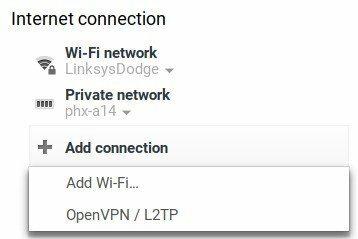 This is known as the “Chromebook L2TP Setup” method, or the OpenVPN method. This is the most secure way to protect your data when browsing the web. Option C (Almost free – Most Secure): Use Option B, but install VPN service onto your router for 100% security “out-of-the-gate”. This way all Internet traffic that goes through your router will be totally encrypted, anonymous and un-trackable. This is another version of the L2TP method of hiding your online identity by blocking websites and third parties from seeing your IP address or your Internet data. Option D (Free – Least Secure): Go with a WWW-based free VPN website, such as ProxySite.com. Technically, this is referred to as a “Proxy Site” and not a VPN. But it accomplishes the same end goal: provide anonymity, unblocking, and other security features This is another temporary (band-aid) solution that may work for a one-time need, but is not a realistic solution if 100% privacy and anonymity are what you’d like to achieve. If that’s the case, go with Option B or Option C above. In the Chrome browser’s address bar, enter “chrome://settings“. Then under the “Internet Connection” section of the Chrome settings page, click Add Connection. In the “Server Hostname” box, enter (or copy-and-paste) the server address of a server from the IPVanish Server List (link). 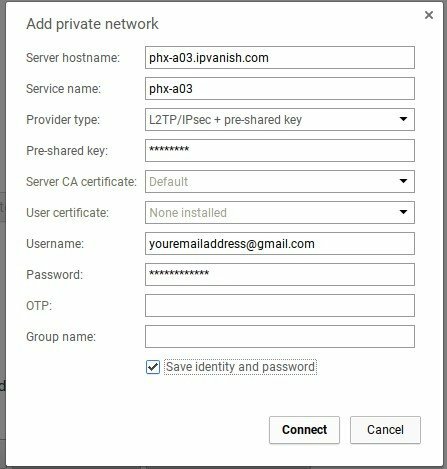 An example hostname from the VPN server list would be “phx-a03.ipvanish.com” for a VPN server located in Phoenix, AZ. Here is a direct link to the complete VPN server list to see all 2,000+ VPN servers in all 50 U.S. States and over 150 other countries. For the Server CA certificate input box, leave it as “Default”. Leave the User Certificate box blank or “grayed-out”. Leave it alone! For username, enter the Username you created when you signed up for your Secure VPN provider. Then enter the password you chose / were given when you signed up for VPN service. Optionally check the box that says “Save identity and password” to keep your login credentials saved in the browser. For the OTP box, leave the box blank. Also leave the “Group name” field empty. After the server connects, you’ll see a notification icon under the Internet Connection appear. You can now close the Chrome browser Settings page. Feel free to Add as many VPN networks as you’d like, so that you can switch from one Virtual Private Network to the next on-the-fly! Pro Tip: Find the top 5 fastest / most reliable servers from the VPN server list (mentioned above) and add those to Chrome. For example, add 1 server from USA West Coast, USA East Coast, and 3 UK servers. 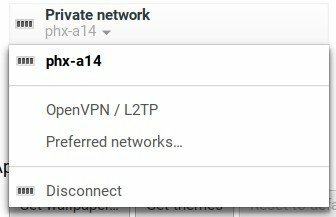 After VPN service is set up on your Chromebook, check your IP at http://whatsmyip.org. You’ll see it’s different from your normal IP address (if you didn’t check your normal IP address before you connected to the VPN, just disconnect, check your normal IP address, and then re-connect. Once your connection is secured with a VPN, you’ll be able to access blocked websites, censored sites, and even blocked Kodi TV Addons and International IPTV Channels! Fortunately, since the Google Chromebook uses the Chrome browser for pretty much all of its functionality, we have at least four simple solutions to connect Chromebook to VPN service. 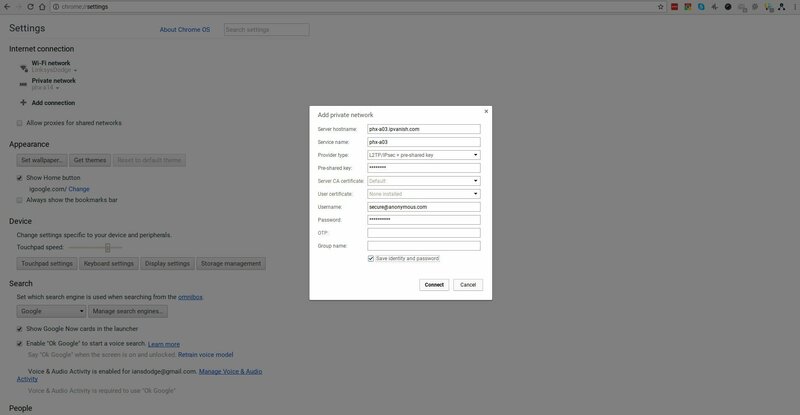 How to Set Up Chromebook VPN: Option 1 (FREE) - Chrome browser extension. Option 2 Almost Free) - Use a permanently-secure VPN. Option 3 - Use a proxy site.